Is backing up your data the same as exposing it? In this case - Yes! Losing contacts from your mobile phone is highly inconvenient. There's seems to be a solution - You can find them online! The catch? Your contacts are in a publicly accessible place. 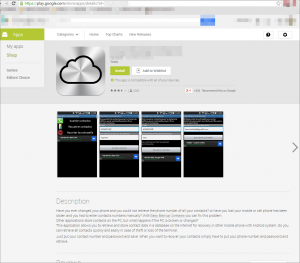 If you care for your privacy you should always be suspicious about "Cloud Backup" solutions you find in the Google Play Store. The solution that is being analyzed here backs up your personal contacts online. In public. Upon starting the application, you will find a screen where you can put your mobile number and a password of your choice. Then you can upload your contacts in the cloud. A brief analysis inside this application shows us how exactly it backs up your contacts in the cloud. The contacts are associated with the phone number that you have given in the previous step and they are sent through HTTP POST requests in a PHP page. Further analysis through IP traffic capturing with Fiddler helped usdiscover the results in the pictures above; a page located online, for anyone to see, that contains thousands of un-encrypted entries of phone numbers and passwords. Using the info in the app you can retrieve personal private data (contacts) from another user. The Play Store page says that this app has been installed 50.000-100.000 times. This is a big number of installations for an application that doesn't deliver the basic secure Android coding practices. The developer must use technologies like HTTPS, SSL and encryption on the data that are transferred through the web and stored in the server. Nogotofail is a useful network security testing tool designed by Google to "to help developers and security researchers spot and fix weak TLS/SSL connections and sensitive cleartext traffic on devices and applications in a flexible, scalable, powerful way." The application has been reported to Google without receiving any response. Avast detects it as Android:DataExposed-B [PUP].